Chinese Vivo has announced yet another smartphone in the Vivo Y series this time by launching the Vivo Y81 smartphone that comes with a bigger notch display and a full view experience. The new Vivo Y81 comes with MediaTek’s latest Helio P22 Octa-Core processor and runs on the Android 8.1 (Oreo) with Funtouch OS 4 on top. The Vivo Y81 is priced at 4,990,000 Vietnamese dong (around $220) and comes with Black color option. It is avaailable on an online e-store website in Vietnam. No details are currently available about its availability and pricing in other regions outside Vietnam market. 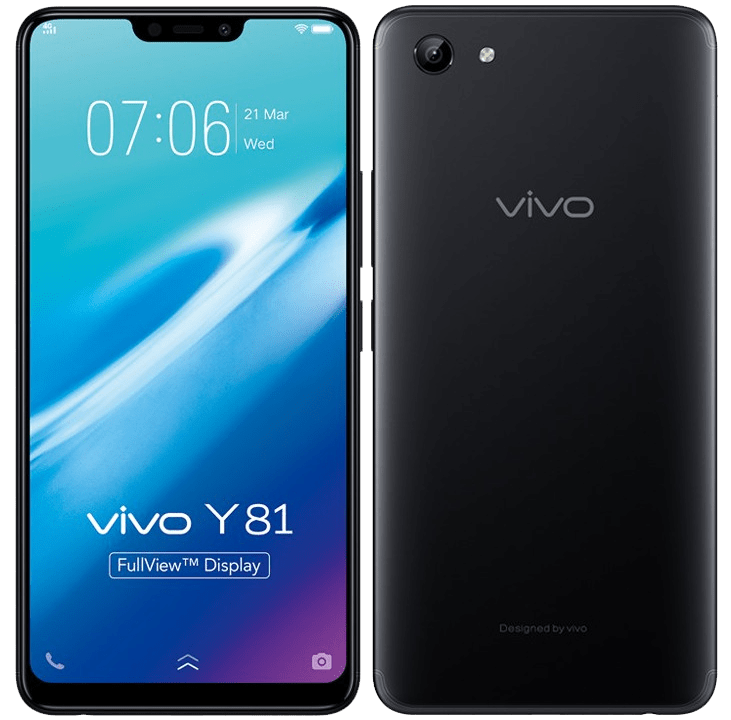 The Vivo Y81 features a 6.22-inch HD+ 19:9 IPS 2.5D curved glass display with 1520×720 pixels resolution and is powered by a 2GHz Octa-Core MediaTek Helio P22 (MT6762) 12nm processor with 650MHz IMG PowerVR GE8320 GPU. It comes with 3GB of RAM and 32GB of internal storage capacity that is further expandable up to 256GB with microSD card slot. It supports Dual SIMs and runs on the Android 8.1 (Oreo) based Funtouch OS 4.0 on top out of the box. It features a single 13-megapixel rear camera with LED flash, f/2.2 aperture and also has a 5-megapixel front-facing camera with f/2.2 aperture. It has a 3260mAh battery and supports 4G VoLTE, WiFi 802.11 ac (2.4GHz / 5GHz), Bluetooth 5, GPS connectivity options. It measures 155.21x 75.24 x 7.7mm and weights 146 grams. Vivo has launched Vivo Y83 last month with a 6.22-inch HD+ 19:9 IPS display with 1520×720 pixels resolution and is powered by a 2GHz octa-core MediaTek Helio P22 (MT6762) 12nm processor with 650MHz IMG PowerVR GE8320 GPU. It comes with 4GB of RAM and 64GB of internal storage capacity that is expandable up to 256GB with microSD card slot. It runs on the funtouch OS 4.0 that is based on Android 8.1 (Oreo) OS and it comes with Hybrid Dual SIM options. It features a single 13-megapixel rear camera with LED flash, f/2.2 aperture and has an 8-megapixel front-facing camera with f/2.2 aperture. It is backed up by a 3260mAh battery and connectivity options it supports includes 4G VoLTE, WiFi 802.11 ac (2.4GHz / 5GHz), Bluetooth 5 and GPS. It measures 155.21x 75.24 x 7.7mm and weights 150 grams.